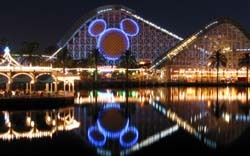 The presented room availability, rates and discounts are actual and final for all our 102 hotels in Anaheim. When night falls to the city, numerous clubs, bars and restaurants of the city wait for their visitors. As the competition between institutions is quite large, each of them tries to attract new guests by interesting and enchanting cultural programs and entertaining activities. Anaheim will also be liked by shoppers. If your aim is to purchase gifts and souvenirs for kids, we suggest going to stores located in the Downtown Disney Park. In addition to large shopping pavilions, the park is the location of several open air markets, where you can buy interesting handicrafts and antiques. Fashionable footwear, clothing and perfume by best brands can be found in Anaheim Indoor Marketplace mall, which is located in the central area of the city. The mall is home to numerous shopping boutiques that sell the goods by the world's leading brands. You will find there special clothing stores for young people and several cozy coffee houses. Anaheim Plaza is a no less well-known shopping complex, where you can find widest choice of products, starting from branded perfumes to household appliances. Those tourists, who are not satisfied with the items sold in the abovementioned complexes, should move their feet to the pavilions The Shops at Anaheim GardenWalk. The boutiques located there often organize seasonal sales, so there are always more than enough buyers there. Among the street markets we should definitely mention Anaheim Farmer's Market – this market is a great place to buy interesting souvenirs and antiques. The market will be surely liked by collectors - Anaheim Farmer's Market is known as the most popular flea market in the city.